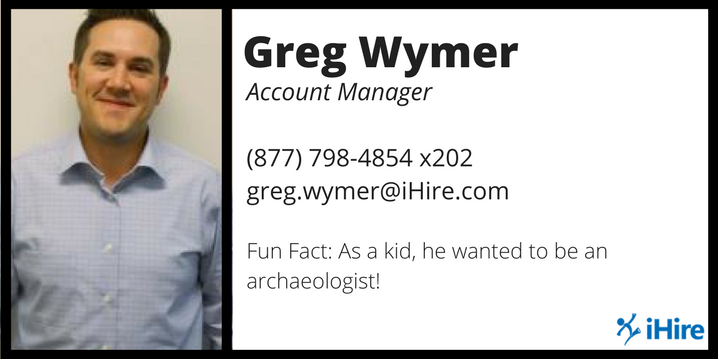 Meet your Account Manager, Greg Wymer! Greg joined iHire in September 2017 and has a wealth of client service and support experience in a variety of industries. His steadfast commitment to customer satisfaction makes him a key member of the iHire team. GW: I am originally from Alma, MI but grew up in Angola, IN. 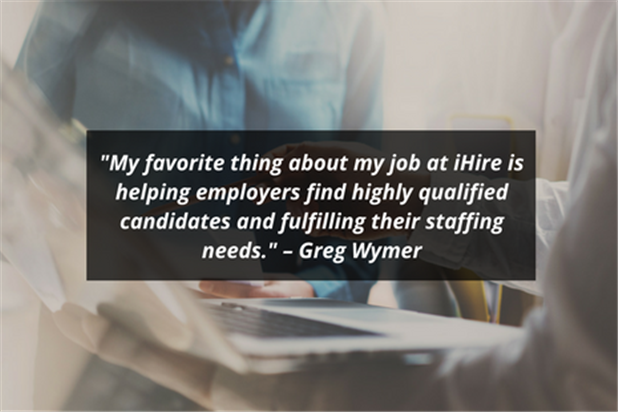 GW: My favorite thing about my job at iHire is helping employers find highly qualified candidates and fulfilling their staffing needs. GW: For employers and hiring managers, we send out targeted emails to highly qualified candidates in their area. We do everything we can do to get our clients’ open positions in front of the right talent. We focus on quality, not quantity! GW: I’ve worked in a number of industries, but a common thread in my career history is providing top-notch customer service and support. I’ve been a loan officer for mortgage and consumer loans and sold shoes as well as golf equipment and apparel. I enjoy helping people find the right products and solutions for their specific needs and budget. GW: What excites me most is that I am on the frontlines of the employment industry. Our software connects our clients to qualified candidates. At the same time, candidates can use our career sites to find open positions that fit their background and experience. I am also excited that the unemployment rate is so low! GW: I enjoy spending time with my wonderful wife Heather, as we enjoy the same things like traveling, hiking, watching movies, and staying in nice hotels. When I am not doing those things, you can find me on the golf course or practicing golf. GW: I really wanted to be an archaeologist. I am obsessed with The Curse of Oak Island, a series on the History Channel. The show is about a group of people that are hunting treasures such as the Ark of the Covenant, Holy Grail, and other ancient artifacts. Most importantly, they respect the process. GW: My favorite movies are Braveheart and Tommy Boy – no explanation needed! GW: With unemployment rates being so low, we are in a candidate-driven market. That means candidates can afford to be picky about the types of jobs that they seek and apply to. We have seen employers have success with offering perks such as sign-on bonuses, but if this is not an option, then make sure you are doing everything you can to communicate your employer brand and really sell your company and the job opening to your target audience.